Do you have too many turnouts on your garden railway? Is it a pain to control them? It can be easier. There are many ways to control turnouts, but most of them require too much repetitive work. This article takes a hint from 1:1 scale railroad practice and describes a method of designing and building an interlocking plant such that turnout control becomes much easier. Building an interlocking is easy, inexpensive, flexible, and walk around controllable. Once you try it, you'll never go back. There are many methods currently in use for controlling turnouts. They can be controlled mechanically with a switch stand or ground throw, electrically with attached motors and remote switches or pneumatically with air cylinders and remote air valves. However it is done, model railroad control systems usually activate only one, or maybe two turnouts at a time. The method described here provides full interlocking control of sets of any number of turnouts. All you need are the control switches that you might have already and a handful of diodes. If you already use the Aristo Craft Train Engineer, you can make the A-E buttons control the routes as well. Other radio remote control systems can be easily adapted as well. On narrow gauge or branch lines, individual turnout control is prototypical, a brakeman must get off the train and throw each turnout by hand. On real Class 1 railroads and many modern smaller operations, turnouts and signals are often controlled by an "interlocking." An interlocking is some arrangement by which several related turnouts and signals are controlled together as sets. For example, most main line sidings, crossings, interchanges, and yard or terminal throats are controlled by an operator in a switch tower or a remote dispatch center. The operator manipulates controls which set up "routes" through the trackwork instead of individually setting turnouts and signal aspects for each device. This method of control reduces operator workload and significantly reduces the chance for errors and subsequent accidents. This interlocking concept can be applied to garden railroads as well. While safety is a concern (train wrecks can both embarrassing and expensive), the primary motivation behind implementation of an interlocking plant on a garden railroad is to reduce the work necessary to set up a route through complicated trackwork. The more complicated the trackwork is, the more effective interlocking control can be. An advantage for the model that does not apply to the prototype is that the interlocking can also perform automatic track power control and routing through the use of switch contacts on the turnout motors. The simplest form of an interlocking is so basic that it may not be recognized as one. A crossover between two parallel lines is often connected as an interlocking. There is no reason to flip one turnout without flipping the other so both turnout motors can be wired in parallel and operated from one control. A simple passing siding can also be controlled as in interlocking, however this may not always be desirable. If both turnouts are controlled together, then a complicated switching maneuver such as a saw-by or double saw-by could be difficult or impossible. The previous examples are really too simple to make the creation of special circuits desirable. Interlocking control becomes really handy when a little more complicated trackwork is involved. How this might apply to your railroad depends specifically on its design, the more complex it is, the more interlocking control can help. If you find yourself throwing two or more turnouts at a time to do any switching moves at all, read on. One common application of interlocking control is for setting turnouts along the lead track of a stub yard. It would be convenient to press one button and automatically align all the turnouts to service one particular stub. It would also be nice to have power routed to that one stub and to none of the others. The next section of this article steps through the design of this simple interlocking for a stub yard to show how it can be done at minimal cost and complexity. This straightforward example will serve to demonstrate a design method. Interlocking control for much more complicated trackwork can be designed by exactly the same step by step method. My method uses a circuit called a "diode matrix." This is just a collection of rows and columns of wires with diodes connected at some of the crossovers. There is no fancy electronic design involved in this brute force approach and just about anybody who possesses the most basic of electrical skills should be able to build one. The use of a diode matrix to control routes is not at all new. 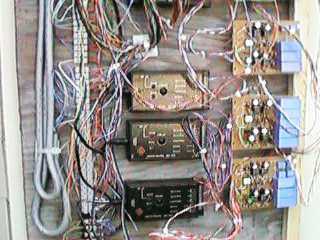 Circuits similar to the ones shown below can be found in many model railroad electrical circuits books. The versions that I have seen can be made to work, but they are not completely flexible. Sometimes certain combinations of turnout logic can not be accommodated. In other cases, a turnout that is not part of the route logic will be thrown too. The new feature of this diode matrix (new to me anyway because I have never seen this done before) is the double row concept. This allows complete freedom to independently control each turnout motor with no ambiguity and no parasitic effects. The example shown below is very simple, however the method is equally well suited to control incredibly complicated trackwork. The method involves five distinct steps. There are a limited number of reasonable ways that a train could be expected to traverse any section of trackwork. Each of these ways is called a route. In the case of the simple stub yard there are five routes, one to each stub. Name each route something that makes sense. In this example, the names are Stub #1 through Stub #5. Also name each turnout, I've chosen Turnout #1 through Turnout #4. If the four turnouts were controlled individually, there would be four controls, one for each turnout. An interlocking control will have five controls, one for each route. At first, this may not seem to be much of a simplification. However to select any given stub track with the interlocking system requires activation of only one of those controls without regard to the present state of any of the turnouts. The non interlocked system requires manual evaluation of one to four of the four turnout positions and possibly changing all four of them. Also, the controls for the non interlocked system are two way, so there are really eight commands. If you want to use a walk around control system with a limited number of available commands, conservation of commands is important. Signals can be controlled as well by treating them as turnouts and defining states for them. A signal device must latch with a pulse command to be integrated with the turnout control diode matrix. LGB signals do latch and should work fine. A truth table defines the output state of a system based in its inputs. For the stub yard example, the inputs are the routes to be selected. The outputs are the positions of the turnouts. There are actually three possible states for each element of the truth table, "straight", "curved" and "don't care." The don't care case means that the turnout can be left in whatever position that it is in already. Explicit states could be defined for those turnouts, but that would just add extra diodes to the diode matrix and cause some turnouts to be thrown where it doesn't really matter. The truth table for the simple stub yard has five rows, one for each the five routes and four columns, one for each of the four turnouts. Each intersection in the table defines a state of one turnout depending on what is supposed to happen to that turnout when a particular route is selected. For your railroad, you will have to write and fill out your own truth table. It takes some thought to determine the proper routes, but after the routes are defined, filling in the table is nearly automatic. Just look at your track plan and fill in the proper state for each turnout so that a train can follow the chosen route. A circuit called a diode matrix will be used to implement the truth table. A diode matrix is a set of wires arranged in rows and columns with diodes wired at some of the intersections. This is actually a very simple form of ROM or read only memory. It stores the "program" for how the interlocking is to operate. Due to the particular nature of large scale turnout motors, the diode matrix used in this method is actually two interspersed matrices. The motors require a pulse of current to operate, one polarity switches it one way and the other polarity switches it back. One of the matrices provides the positive pulse and the other provides the negative pulse. The method can also be adapted to twin coil switch machines such as older LGB machines or typical small scale machines. Slow motion machines will need to be wired to complete their own cycle after being started by a pulse. Stall motors can be wired from Atlas Snap Relays. If you use air operated turnout motors, you can add routing control but it'll cost you more. You'll have to find some electrically operated air valves and run them from Atlas Snap Relays wired like the twin coil switch machine shown. You'll need one for control valve for each turnout. Without interlocking control a typical large scale turnout control switch can wired as shown. A double-pole, double-throw momentary switch, DPDT (on)-off-(on), is used to create the current pulse from a single polarity source provided by the diode. The polarity of the current pulse depends on which way the switch is pushed. This method is not suitable for use with a diode matrix as neither motor wire can be connected to a common terminal. Another way to control a turnout motor is to provide both polarities with two diodes and switch between them. A simple form of this circuit uses a single-pole double-throw, SPDT (on)-off-(on), switch. With this method, one side of each turnout motor can be connected to a common return wire back to the AC power source. This is the method used in LGB and Aristo turnout motor control boxes. A modified version of the second form of control using the SPDT switch is used in the dual diode matrix. There are five inputs (control switches) on the left connected to ten rows. Each control switch is extended to be a dual pole momentary DPST off-(on) switch that activates both a positive and a negative row together because there may be a need to throw turnouts in either direction with a single command. There are four columns, one for each turnout motor. If there is a diode at the intersection of one of the dual command rows and a motor column, that motor will be activated. Which direction it will go depends on which of the dual rows has a diode. The diodes that wire to the "positive" row are wired in one direction and the diodes wired to the "negative" row are wired in the other direction. Note that there are NEVER two diodes installed from the same dual command row to any given motor. If there were, the matrix would be commanding the motor to go both ways at once. Nothing will burn out immediately but the resultant AC voltage placed on the turnout motor will cause a strong buzz and it'll be obvious that something is wrong. Depending on the size of a diode matrix, many turnouts may be thrown at once. This version throws as many as four. The rectifier diodes from the power pack are paralleled to increase their current handling capability although one diode will actually handle five motors. You can also use larger diodes. The power pack will also have to provide enough current to power several motors. I was able to run nine turnouts from an MRC 9300 power pack, but it didn't quite have enough output capability to handle ten. A 24 VAC 2 amp transformer (available at Radio Shack), and 2 or 3 paralleled 1 amp rectifier diodes should be sufficient to power a large matrix. Any power source should be properly fused for safety, preferably on both the primary and secondary sides. With 24 volts applied to one of my matrices, ten motors, six with LGB 1203 accessory contacts, operate very smartly. This diode matrix is wired on standard 0.1" centerline bare perforated circuit board with #18 copper wire for the matrix lines. The top side of the board has the diodes and the column wires leading to the motors. The backside has horizontal wires that are the rows. This board actually has two matrices of different sizes with only one column in common between the two circuits. The two matrices control two different regions of my layout with only the one turnout that connects the two regions controlled by both matrices. If you haven't dealt with diodes before, these devices are designed to pass electrical current on one direction only therefore they must be wired in correct direction. Buzzing turnouts indicate a mistake. The diagram shows the correspondence between the schematic symbol and a typical diode case markings. The 1N4000 series diodes are very common and you shouldn't pay more than $0.10 each for them. Sometimes you can find them in packages of 100 or more for a penny each. If you can't find something marked as 1N400X, then use any diode rated at 50 volts or greater and 1 amp or greater. The diodes in the matrix do not have to all be the same type. Avoid using filtered DC power to run LGB turnout motors. The LGB motor is designed to operate from half wave rectified unfiltered power. The turnout motor is "impedance protected" by the inductance of the motor winding and will withstand continuous application of half wave current, at least for reasonable periods of time. With pure DC applied, there is almost no internal current limiting and the motor will burn out after a few seconds. This can easily happen if a control switch sticks or gets pressed continuously. The Aristo motor is protected by internal limit switches such that application of continuous half wave or DC power is not a problem. An LGB turnout motor that buzzes loudly but does not move may indicate that AC power is being applied to the motor, or that the turnout is stuck or jammed, perhaps by a piece of ballast. The motor may not actually burn out immediately, but continuous application of AC will ruin the permanent magnet inside. An Aristo motor that is fed AC power will madly cycle back and forth. In either case, if DC power is used you won't get the audible feedback that something is amiss before something else burns up. Apply the AC power and use a voltmeter to check for positive DC voltage on positive power bus. The black lead of your meter should go to the ground return of all the turnout motors. You should get a reading of about half of the AC input voltage. This may vary depending on what kind of meter you are using. Then check the negative power bus. You should get about the same reading but the voltage will be negative. First test for proper turnout motor connections. Manually set each turnout to curved. Connect a clip lead to the first turnout column and momentarily touch it to the positive power bus. The motor should flip to straight. Then touch the clip lead to the negative power bus, the turnout should flip to curved. If the motor goes backwards, reverse the wires to the motor. If the motor doesn't flip at all, check the connections to the motor. Repeat this test for each column until you can reliably flip each motor. Test the matrix by selecting a route. All the turnouts for that route should flip together. 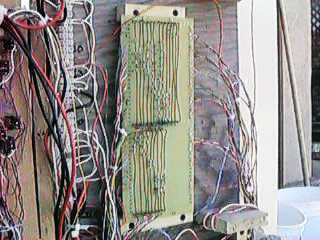 If the routing is not correct, look for a diode wired at the wrong matrix junction or a missing or improperly connected diode. If fuses or diodes fail, look for unintended short circuits like solder splashes. If a turnout motor buzzes (or an Aristo motor cycles) look for a stuck control switch or two diodes wired from the same dual command row to that motor. If all the turnouts don't throw every time, get a bigger power source or check your motors for proper operation. Track power routing can be implemented without interlocking control. All that is needed is an accessory switch connected to a turnout motor to do simple power routing. However, having a coordinated set of programmatically controlled contacts available as a result of interlocking control is too inviting an opportunity to pass up. In the case of the simple stub yard, fully automatic power routing is a natural extension to interlocking turnout control. When a particular stub is selected, power is routed that stub and to none of the others. Both LGB and Aristo turnout motors can be used for power routing. The LGB 1203 accessory contact snaps on the end of a regular turnout motor and provides a DPDT set of heavy duty contacts. The Aristo turnout motor has a set of medium duty SPDT contacts already installed. Either can be used for most power routing situations although circuitry involving reversing (for wyes and reverse loops) will required DPDT contacts. LGB and Aristo turnouts can be mixed and the diode matrix will still work fine. You also need to insulate one rail of each power routed track. A plastic insulated rail joiner will work fine. The LGB 1203 places an additional mechanical load on its turnout motor so that the motor takes a little more electrical power to reliably flip. A 24 VAC power source really helps out here. This is a schematic diagram for power routing the stub yard. It uses only SPDT contacts. Each switch either routes power to it's stub or sends the power down the line for more routing. Note that one route is always powered. To turn the whole yard turned off, power to the yard can be routed from a turnout that enters the yard, or master power switch can be provided. Note that with this method, no power wires have to run back to a control panel. Power is picked off the track leading to the yard right at the entrance to the yard. Remote turnout control will usually tie the operator to a control panel. This is not a serious problem for most indoor layouts, but it is a real inconvenience for a garden railroad. There have been a lot of methods used to allow walk around train control on garden railroads, some form of radio control being the most common. Walk around remote control of turnouts is much less common. Remote control of turnouts is not always necessary. Where there are few turnouts and the routes are simple, manual control with the aid of a broom handle is very effective. Turnouts that cannot be reached with the broom handle can be controlled by switches mounted on accessible posts near the turnout and powered from a hidden 9V battery. A standard 9V battery is strong enough to throw one turnout but not strong enough to burn out an LGB turnout motor in case of an accident. This form of turnout control is very prototypical, you are the brakeman who gets off the train when needed to throw a turnout. However, you still can't route your trains from your chaise lounge or when your other hand is holding a cylindrical fluid refreshment device. For those of you that are already using the Train Engineer throttle by Aristo, you can have automatic interlocking control and walk around capability in the same hand held unit. A new product announced by Aristo is the ART-5475 Remote Accessory Panel. This is a remote receiver which will control up to five turnouts through the use of the A through E buttons on a Train Engineer transmitter. Up to ten Accessory Panels can be controlled from one 10 channel transmitter by using the track keys. Pressing an A thru E key will set one turnout. Pressing the same key again will set it back. If you reprogram the transmitter to other channels, or use other transmitters, you can control up to 50 turnouts. The older ART-5474 receiver will work also, however you do need to build some moderately complicated converter circuits to adapt the 5474 to the diode matrix. See the circuits at the bottom of this page for the schematics. The 5474 has an advantage is that it can control up to 25 routes on one transmitter channel instead of 5 for the 5475. The 5475 provides an alternating positive or negative pulse at each of its five outputs. This is great for controlling a single turnout, but it is not suitable for driving a diode matrix. Also the 5475 really doesn't have enough output power capability to drive two motors from one output. To drive the diode matrix, a relay must added to convert the bipolar output of the 5475 into a DPST switch closure. This relay can be connected to the diode matrix that we just designed as shown below. The relay coil does not care if the driving pulse is positive or negative so that each time an output is commanded, the associated relay will activate and work just like the manually activated toggle switch. Therefore each command selects a single route each time that it is pressed without regard to any pre-existing turnout state. The relay contacts are capable of handling a lot of current so that many turnouts can be driven at once. Since all that is needed to control the matrix by remote control is a relay closure, any receiver or decoder intended for turnout control can be adapted. Proprietary radio control systems that will work are available from RSC and Locolinc. Most DCC systems have stationary decoders that can be used. For systems intended to control twin coil type motors, each twin coil motor output can be used to control two routes by hooking a relay to each motor coil output. This matrix is similar to the manually controlled matrix but the DPST switches have been replaced by DPST relays. One relay is needed for each route. I have used a 12 volt printed circuit mount DPDT relay available from Radio Shack (part number 275-249) for about $4. It has 5 amp contacts and should handle any sized matrix. Any other relay with a coil voltage between 9 and 24 volts and suitable contact configuration and ratings will work as well. If you wish you can retain the manually operated switches in addition to the relays, just wire the switch contacts in parallel with the relay contacts. I have been so pleased with the operation of the interlocking control system described that I've built five of them, three panel controlled versions on an indoor layout and another two radio controlled interlockings on a garden railway. On the garden railway, I've virtually abandoned the full control panel that I had previously built because I don't need it anymore. If you can't wait for the new ART-5475 to come out, as I couldn't, you can use the circuit below to adapt the outputs of the ART-5474 to drive the diode matrix. These circuits work, I use them every day. Since these converter circuits are a moderately involved electronics project, I assume that anybody that will try it has sufficient skill to work from a schematic. If you are electronically challenged, I would recommend that you use the ART-5475 as the circuitry is be significantly easier. The heart of the circuits is a common integrated circuit timer, often called a 555. They also come in dual versions called a 556. You can get either of these IC's from Radio Shack. The timers take a negative going input trigger and generate a 200 mS output pulse, long enough to throw a turnout motor. The A and B outputs are wired straight through from the ART-5474. This is also the same wiring that would be used for all five outputs of the ART-5475. The C output is isolated by a generic optoisolator (NTE 3041 or 4N28) and then the signal is conditioned to generate a negative going pulse for either a positive or negative edge of the C input. This pulse is then used to trigger the timer. The D and E outputs are just triggered from the optoisolators that are wired inside the ART-5474. It many also be possible to use the output of the D and E outputs of the 5474 to drive a transistor that drives the relay directly. I opted instead to control the pulse width with the 555 timer. The optoisolator in the 5474 does NOT have the current sinking capability to drive a relay directly. See ART-5474 Tips for more information on the ART-5474. I built five of these circuits on circuit boards that I got at Radio Shack (276-168B). All five are laid out somewhat differently but they all fit on the boards.